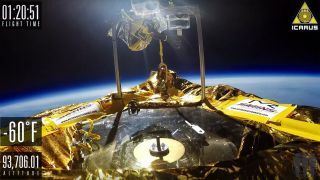 The first vinyl record has been played in space after Jack White’s Third Man Records launched a custom-built turntable by balloon. And he hopes the feat – completed over four years with the help of engineer Kevin Carrico and the Students And Teachers In Near Space organisation – will prove inspirational among music fans. White last month announced the project as a way to mark his label’s seventh anniversary and third-millionth record pressing. The Icarus craft reached a height of 94,413 feet while playing a gold-plated disc containing late astrophysicist Carl Sagan’s A Glorious Dawn recording on repeat. The balloon burst after 81 minutes of flight and Icarus fell to Earth under a parachute – and it was still playing the record when it was recovered. White said: “Our main goal was to inject imagination and inspiration into the daily discourse of music and vinyl lovers.